Astronomers using the Green Bank Telescope in West Virginia and the Australia Telescope Compact Array have discovered that diamond dust is responsible for a mysterious glow emanating from certain areas of the Milky Way Galaxy. This mysterious glow is known as the anomalous microwave emission (AME). 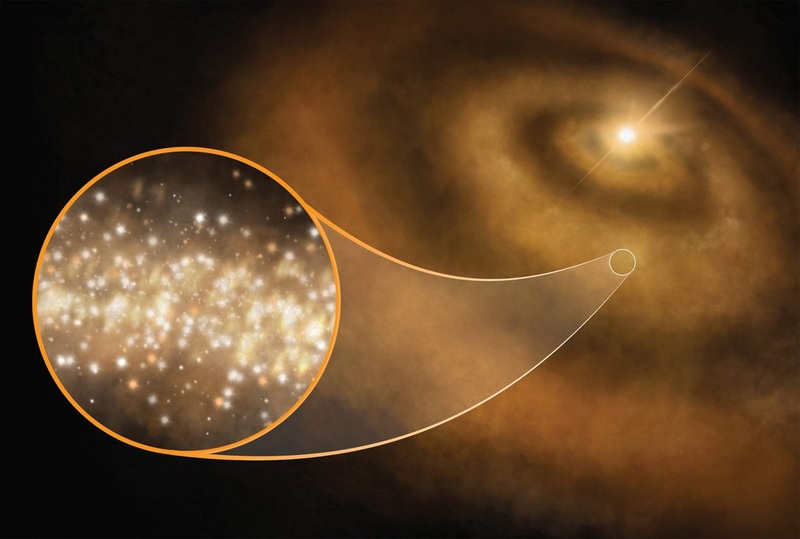 In the new study ,astronomers were searching for AME light in 14 newborn star systems across the Milky Way. In three of these systems, these emissions were found emanating from planet-forming disks of dust and gas swirling around the stars. The unique infrared-light signatures of nanodiamonds - carbon crystals far smaller than a grain of sand - in these same three systems. This study is "good news for those who study polarization of the cosmic microwave background, since the signal from spinning nanodiamonds would be weakly polarized at best," said co-author Brian Mason, an astronomer at the National Radio Astronomy Observatory in Charlottesville, Virgina. "This means that astronomers can now make better models of the foreground microwave light from our galaxy, which must be removed to study the distant afterglow of the Big Bang."